SPOKANE, Wash. (AP) Gonzaga is coming off the greatest basketball season in its history but apparently that doesn’t impress the other West Coast Conference coaches. The Bulldogs, who lost many key players from a team that advanced to the NCAA title game, were picked this year to finish second in the WCC, behind archrival Saint Mary’s. It’s the first time in 17 seasons that the Bulldogs were not picked to win the league. Gonzaga broke through all kinds of psychological barriers last season when the Bulldogs (37-2) advanced to the title game, where they lost 71-65 to North Carolina. They had never before gotten beyond the Elite Eight. But the Bulldogs lost Przemek Karnowski and Jordan Mathews to graduation, and Zach Collins and Nigel Williams-Goss early to professional dreams. Josh Perkins and Williams are the returning starters, and veterans Silas Melson and Killian Tillie saw plenty of minutes last year. Everyone else is basically a question mark as the team seeks a 20th consecutive NCAA Tournament appearance. 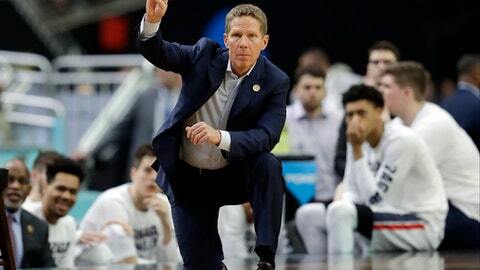 Coach Mark Few has made a specialty the past 20 years of reloading the Zags. This year is not likely to be different. Jacob Larsen, Zach Norvell Jr. and Jack Beach are coming off redshirt seasons. Alex Martin is a community college transfer, and Rui Hachimura and Jeremy Jones showed some flashes in limited minutes last year. Also on the roster are freshmen Joel Ayayi, Corey Kispert and Jesse Wade. Kispert might provide immediate help. Brandon Clarke, who averaged 17 points per game for San Jose State last year, must sit out this season to satisfy NCAA transfer requirements. The Zags this season did not land a graduate transfer impact player, as they have done in recent seasons. ”It’ll be different looking,” said Few, who has the highest winning percentage of any active coach. LEAGUE PLAY: Gonzaga has owned the WCC for years, winning 20 conference championships since 1994. But Saint Mary’s and BYU have provided solid challenges. Last year, BYU beat the Zags in Spokane, handing them their only regular-season loss. THE SCHEDULE: Gonzaga has a solid non-conference slate again. They play some of the nation’s top programs in the PK80 Invitational in Portland, Oregon. They also play at Villanova, San Diego State and at home against Utah State and Creighton. FEW LOSSES: Few has an overall record of 503-113 in 18 years as head coach. GOODBYE JERRY: Jerry Vermillion, a 6-foot-4 center who became Gonzaga’s all-time leading rebounder, died in late October. Vermillion, 85, grabbed 1,670 rebounds from 1952-55. Elias Harris is a distant second with 979 rebounds. ANOTHER STREAK: Gonzaga has won at least 25 games for 10 straight seasons. ONE MORE STAT: In the past decade, Gonzaga’s .777 winning percentage on the road or on neutral courts is tops in the nation.